After his phenomenal debut Kaili Blues (2015), Bi Gan's sophomore effort, Long Day's Journey into Night, doesn't disappoint in terms of ambition, technical prowess and sheer ecstatic beauty. I've never experienced anything quite like it, as far as an immersive moviegoing experience goes. If the uncut 40-minute shot in Kaili Blues took your breath away, just wait until you see a continuous hour-long 3D scene in the latter half of the film. Its pure cinematic power lets you believe that cinema is still alive and well. Bi Gan is no joke, folks. He is that rare combination of a filmmaker who really knows how to incorporate technology into an artistic medium, and runs amok with it. Lu Hongwu (Huang Jue) returns to Kaili for his father's funeral after many years of absence. There at his father's house, he finds an old photograph of a woman hidden in an old clock. As Lu tries to find her whereabouts, the noirish road trip morphs into an internal journey where his past and present and dreams are all intermingled. There are some very loose and abstract connections throughout, about his lost love and his sidekick named Wildcat who was murdered. It's monsoon season in Kaili, the southern subtropical region of China. The air is damp, the walls are blackened, the basements are flooded and it's night. It's always night. The water drops flicker under the overhanging lighting fixtures. The sound of raindrops gently hitting the metal sidings, the cigarette smoke, the colors.... The atmosphere is so rich and dense, you want to reach out and touch it. Lu hits up a mysterious woman (Tang Wei of Lust, Caution) in a shimmering green dress and follows her in his car into a dank tunnel. Her resemblance to his old flame is uncanny, he tells her. She flirts but never gives in, always leading, always seductive. Her name is Wan Qiwen. That's a Canton popstar's name, he quips. Is this scene from the past or is it a dream? In an outdoor stage, Lu waits for Wan to come out and sing. A woman suggests going to a movie to kill the time. This is just over an hour into the movie. He goes into the movie theater and puts 3D glasses on and this is our cue to follow suit. We see the title for the first time in 3D as we follow Lu at night. A boy in a room, where Lu wakes up, says he will show him the exit if he beats him at ping-pong. Lu handily beats the kid at the game. The the boy leads the way down to an outdoor market. There is only one way to go down and it's the jerry-rigged one-seat cable car/zip-line. We follow him from behind and slowly descend into the dimly lit labyrinthine market. Now Wan is a young woman who manages a pool parlor. There are young hooligans giving her a hard time. Lu intervenes. It's her boyfriend's business and she is just overseeing it in his absence. It's the dead of night and she is closing the shop. Lu is mesmerized by her likeness to Wan/ex-lover and can't get away. This lucid, languid night stroll continues ever so leisurely. Lu loses Wan and then finds her again. Like in a dream, the time stretches yet stands still. We take a literal flight to the other parts of the market, we take the steps up and down, waiting for a daybreak, all in one continuous take. 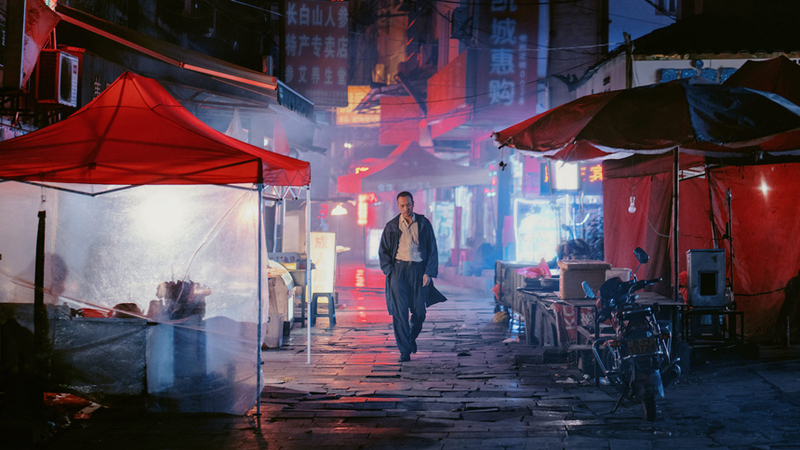 Long Day's Journey into Night plays as part of NYFF 2018. A complete schedule can be found here.